I was recently sent a copy of Against the Odds: the Adventures of a Man in His Sixties Competing in Six of the World's Toughest Triathlons across Six Continents to read and review on the blog. I know I don't talk about it much here, but I really like to read a lot. My for-enjoyment reading took a big hit in college because I never wanted to spend a lot of time reading after staring at textbooks for several hours. But after college, I found I had a lot more time to sit down with a good book and I took advantage of that time. 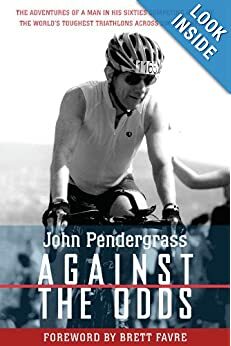 Against the Odds follows author John Pendergrass as he attempts to complete six Ironmans on six different continents all in his sixties. When most people are starting to think about retirement, John started to look for a new challenge. A challenge that would really push the envelope physcially, mentally, and emotionally. An Ironman is no easy feat--2.4 miles swimming, 112 miles biking, and then a grueling 26.2 miles running. And all this must be completed in no more than 17 hours. It has the ability to beat down even much younger athletes, but he took on the challenge. The book starts off with some history of how the Ironman came to be. It started with a debate about which endurance athletes were the most fit. To answer this question, they put together the three long-distance competitions in Hawaii: the Waikiki Roughwater Swim, the Around Oahu Bike Race, and the Honolulu Marathon. Whoever won--a cyclist, swimmer, or runner--would be called the Ironman. And thus started the Kona Ironman. Now known as the location of the Ironman World Championship. Pendergrass starts his journey in Brazil. Ironman events in the US are notoriously difficult to get into and athletes must often sign up a year in advance, but international events are less popular. Traveling for a triathlon is not a simple task and Ironman travel is more complicated. Triathlons require 3x the gear than a single sport. John gets quite the shock when his bike is delayed and still hasn't arrived in Brazil in the days approaching the big race. Thankfully his bike arrives and he is able to complete his first Ironman. John soon learns that not everyone is interested in hearing his Ironman story and his family is sick of hearing about it pretty quick. I thought this was funny because I feel like I am annoying others when I want to talk about endurance sports all the time. That's why I've found new friends who are also endurance athletes so we can talk shop together. After Ironman Brazil, John takes on Switzerland, South Africa, New Zealand, Arizona, and finally, China. Of course, very few Ironman journeys are complete without a few injuries thrown into the mix and John's journey is no exception. A bike crash left John with a hip fracture. But after a long recovery, John was able to continue on biking, running, and swimming. I wish the book would have covered more of the author's experiences at each triathlon because I really enjoy reading race recaps. Instead he glossed over much of the actual race experience. I did enjoy that after each race, he took time to explore each locale and covered many of that experience in the book. I would love to visit the places he talks about in the book someday. Pendergrass is truly beating the odds in his triathlon journey and it reaffirms my goal to complete an Ironman. On a journey that takes courage and amazing drive, John is definitely an inspiration. Disclosure: I received a free copy of the book for review. I was not paid for this review and all opinions are my own.